The past 2 weeks have been more intense then summer months should be. Our in season months are full, with tons of weeding, harvesting, planting, feeding, moving, watering, hauling, packing, unpacking, washing, bleaching and more. Keeping up with bills and necessary paperwork is typically kept at a minimum until things slow down and tax preparation begins. But the summer, usually, is full on, straight up farm work. 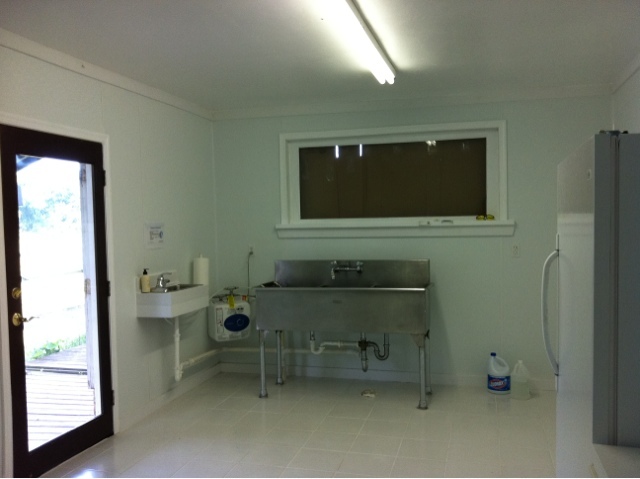 The department of agriculture visited and asked us to install a commercial kitchen. We had planned on doing this, just not during the hottest days of the year, and not at the pace we just did. For a few days tear out occurred. The furnace that had not worked and caused water damage was left at the curb and disappeared in less than an hour. Construction debris was hauled to the dump. Then the build out: insulation, wall board, mud, tape, primer, paint, window hole cut, window installed, FRP and trim on walls, freezers and fridge cleared and moved, plumbing installed, hot water heater, new door, even more trim. More trash cleared and removed. Daily trips to hardware stores, along with repurposing of things found in resale shops, debate on light fixtures followed by a simple solution, and a paint can lid that filled the hole in the tube for the yet to be installed exhaust fan like it was made for it. Water tests. In my email correspondence with our food sanitarian, he asked if we really had everything functional. Yes, we told him, we are ready. And then the real running! Is it clean enough? Is the door sweep on? Are 20 other details completed? All paperwork printed out, signed, answers correct? 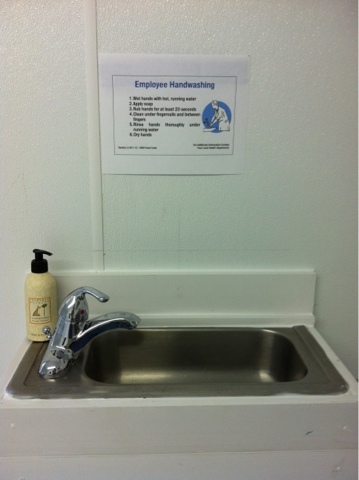 Hand wash sign hung? Much nervous energy, and a bit of swearing. And then the inspector visits. As with so much of the work that Homer has completed over the years: the inspectors enters and says "wow". He had seen the wreckage that was the kitchen in our other building 2 weeks prior, and it was awful. A room we all just ran through because ick, it was bad. As the inspector looked around the room he kept saying "wow" and "I did not believe this would be done". I've seen this happen before. Homer can see through ugliness and realize it is only surface finishes, and he knows just what to do to change it. Now, when he tells me he is ready for tiles, I know all of the things he also needs, that one bag of thinset will not do the job for 216 square feet of tile, I can (almost) do the math to figure out the right amount of bags needed. And every other little thing needed. So we passed. We now have a commercial kitchen. No wall oven or cooktop yet, and we will also need an exhaust fan. They will go in at a little more leisurely pace. We will make and install a curtain, outside, to shade the late afternoon summer sun from beating in that window. It felt like being a bug under a magnifying glass with intense, concentrated light and heat, like a person might just burst into flames. A curtain, constructed from outdoor fabric, will hang outside...no need to test the commercial kitchen code by adding fabric inside there. And then, in the mailbox, a note from our mail carrier that we need to trim out by the mailbox. With almost 13 acres, plenty to do.